Lancaster is in the North-West coast of England. It is located in the county of Lancashire, on the river Lune. The city is one of the major port in England and even before Liverpool. The famous sight is the Lancaster castle that overlooks the city but there are also several things to see and do. 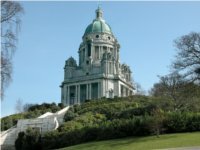 Except sightseeing, Lancaster is well-known for its university which is ranked 10 in the national classification and considered as one of the most prestigious in the country. Lancaster has all sort of places to make your night-life exciting. If you want to dance, drink or even listen to music, pubs, bars and nightclubs are ready to welcome you. So here are a few unmissable places. Belvedere Inn and Brendee’s Irish Pub to eat and have a drink. Lizard Lounge and Tellus360 to attend to concerts. Finally, Tally-Ho Tavern and the Village Nightclub for clubbing. In Lancaster, shoppers can find all they want thanks to many shopping centres and little shops that are all around the city. Marketgate shopping centre, in the heart of the city, offers a wide range of shops. St Nicholas Arcades, Lancaster’s leading shopping centre, in which you can take advantage of different facilities. Assembly rooms market, a bric-a-brac place. The perfect shop to find antique and collectable objects. The vintage shop, a place where you can find vintage clothes whether for men and women. Lancaster Castle, a former prison which closed in 2011. Now, it is a touristic place where you can do a guide tour. Williamson Park, a wooded area where you can have a walk. The park includes a butterfly house, Ashton memorial and fountains. Nowadays, the memorial serves as an exhibition space for concerts or wedding for example. Lancaster Grand Theatre, one of the oldest theatre in England. This permanent theatre proposes a large variety of plays, amateur or professional. Maritime Museum, along the quayside, covers the maritime trade of the city. More precisely, it deals with the history of the port, its implication in the slave trade, the canal, the fish industry. There is also an aquarium and quizzes to keep kids’ attention. St Mary Church, a beautiful example of the English Gothic architecture. The city has a temperate climate with cold winters. The hottest month is July with an average of 14.5 °C and the coldest is January with an average of 3.2 °C. Lancaster is easy to reach thanks to different means of transport. First, the city is crossed by two mainly roads. The M6 motorway and the A6 road both giving access to nearby cities. Then, the West Coast Main Line railway station makes a link between major cities in the region but also in the country. The bus network can lead you all around the city and help you to reach the sightseeing places. The boat is also a well-used transport. For instance, you can do a canal boat trip which can make you see the city in a different way. Finally, the nearest airport is Blackpool International where there are flights to European cities.